Set up in 1792 by Western Quarterly. Its initial component meetings wee: London Grove Preparative, Fallowfield Indulged, Fallowfield Preparative, Doe Run Indulged and Bernards School House Indulged. 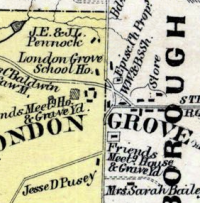 After the Separation, Unionville Indulged also became a meeting under London Grove Monthly. The modern day London Grove Monthly meets at the meetinghouse erected by the London Grove Preparative meeting. 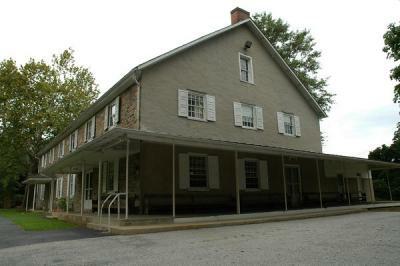 This meeting was set up by London Grove Monthly during the period in which the London Grove meeting house was being built and meetings were held in the school house located just east of Doe Run in West Marlboro. After the meeting house at London Grove was completed, area members who had been meeting in the area near the school house requested an indulged meeting there during the winter months. Meetings continued to be held there until 1827 when the meeting was laid down.